Our trip to Cancun started off so promisingly, but there was no way it could all be smooth sailing and copious amounts of alcohol right? Check out how right I was, when we decided to daringly swim with sharks! The first full day of our vacation in Cancun started out like a fairytale. I awoke to a gorgeous view of the white sand beaches and blue skies just outside our hotel room window, promising a day of perfect weather. All of Friday was spent lazily ‘tanning’ poolside at our gorgeous hotel. Tanning for me, consisted of slathering on the SPF 50 sunscreen, and lounging in the shade of a cabana for a good portion of the afternoon, or getting into the pool with large brimmed pink hat in tow. Thank you, lovely Irish-German heritage, thank you so much! To my credit though, the precautions paid off that evening and no hideous tan lines or lobster-like skin hues were achieved. And dinner was at another fantastic little spot in town named Alhambra. 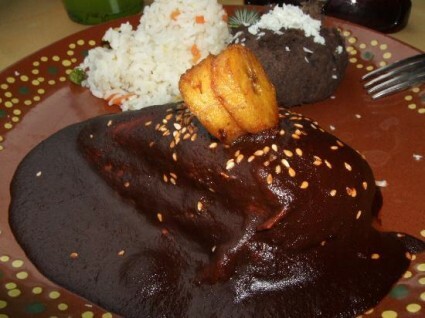 Since before we even left the States, my boyfriend had been reminiscing about how he ate mole (a difficult to make Mexican sauce made from twenty-five ingredients including chocolate and bananas and peanut butter) at least once a day in Cancun on his previous trip there. The restaurant we’d eaten at the night prior, however, hadn’t had mole on the menu. Tonight, Alhambra had it, Sean was ecstatic, and we both ordered it (since I couldn’t remember the last time I’d had it either, and every mole recipe is supposed to be unique), and savor the flavor. Everyone was happy with their tacos or fajitas and the 2-for-1 drink deals. Yet another good day. An excellent preamble to us all completely destroying ourselves the following day while going … whale shark diving! Chicken mole. It may look a little iffy, but trust me, delicious! This day began full of promise before the crack of dawn. Note to self: never schedule anything on vacation that requires you be up at 6:45 AM. But up we were, bleary eyes and all for our cab ride to the marina to meet Captain Nacho (the same captain employed the previous year for whale sharking). After a small kerfuffle during which Nacho attempted to pawn our group of ten off to a lesser captain, he relented and agreed to take the group again. And so began the boat ride destined to decimate the group by its end. The marina Captain Nacho took us to. Look at all the boats for hire! Everyone lathered on the sunscreen at the outset, were excited and looking forward to the whale sharks. Twenty miles out to sea, an hour-and-a-half later, surrounded by dozens of other boats rocking violently, with tons of other eager divers swimming with the whale sharks, the situation was quite different. Almost as soon as we slowed nearing the other tourist laden boats and followed the motion of the churning seas, two of our group (one of whom went last year with similar results) got seasick. A little later into our foray two more got sick as well, though not as bad as Brian and his girlfriend. Brian and Malia were too sick to even contemplate getting into the water (which would have made them feel instantly better – even I felt a little sickly on the boat, but once in the water was much improved). We all warned him to take Dramamine but no, that wouldn’t be necessary. Ha! For those of us with sea legs enough to swim, we donned flippers, masks and life jackets and plunged into the water among the boats and other tourists for an amazing experience. Swimming with sharks larger than the boats around them, capable of swallowing a tourist whole, yet totally harmless to everyone was a fantastic experience. I can’t describe how cool it was to swim beside these huge beasts (I even had the chance to touch the dorsal fin of one shark, which is actually forbidden, though I feigned ignorance when I was scolded), and I feel so lucky to have gotten to try it. The day started out so well. Sunscreen – check! After maybe 45 minutes of periodically jumping into and climbing out of the chop, we asked Nacho to head out. Everyone who could stomach it, had had their fill of the whale sharks and those who couldn’t were beyond ready to get going for calmer waters. 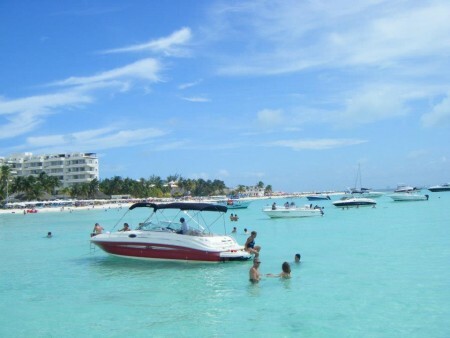 Nacho took us to Isla Mujeres for lunch and stiller waters. I took the opportunity to sit at the bow of the boat and enjoy the wind and sun and view, and this was probably where I made my really fatal mistake that day. Even though I’d applied sunscreen (the spray kind, not the lotion) a couple of times already, the salt and spray and reflective surfaces everywhere conspired against me. By the time we arrived at Isla Mujeres (much to everyone’s relief, especially Brian’s), my skin was feeling a little “tight.” Foolishly convincing myself it was just the salt water that was drying my skin out, I rinsed myself off a bit and applied more sunscreen. 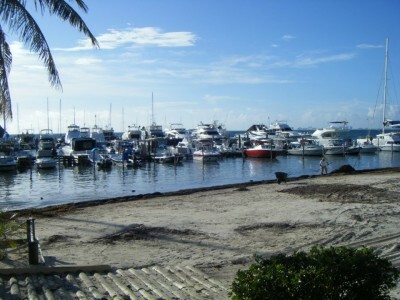 Isla Mujeres, where we stopped after our diving excursion for food and fun. After lunch it was still fairly early in the afternoon, so we stayed in the waist-deep water playing with Frisbees and floaty foam balls, and the fact that yes, I was indeed sunburned (and more than just a little) became more apparent. On the boat ride back to our original dock, I covered every inch of exposed skin and sat in the shade of the boat’s canvas top, but it was no good, I was already feeling the sting. Fast forward several hours to that evening after everyone had cleaned up, had a nap, and we were regrouping for dinner. I felt “pink” but nothing excruciatingly painful… yet. We had dinner at a local restaurant called Calendra Oaxaca, that our concierge recommended for its chicken mole. This happened to be the last night the restaurant was open (it was closing up for business after that), so the menu was more limited than usual. Luckily, the chicken mole was one of the items still on the menu, along with guacamole and a really good queso with pieces of steak in the cheese sauce. I was very satisfied with it (in my opinion it tasted better than the mole from Alhambra), and since we were all so tired from the long day, everyone turned in before midnight that night. So you’re probably wondering did I indeed incur third degree burns? Stay tuned for the next blog and my exciting conclusion to my first trip to Mexico! This entry was posted in Mexico, North America and tagged Boat, Cancun, Isla Mujeres, Mexico, Mole, North America, Shark, Sun, Sunburn, Travels, Whale on May 30, 2014 by Paige N..